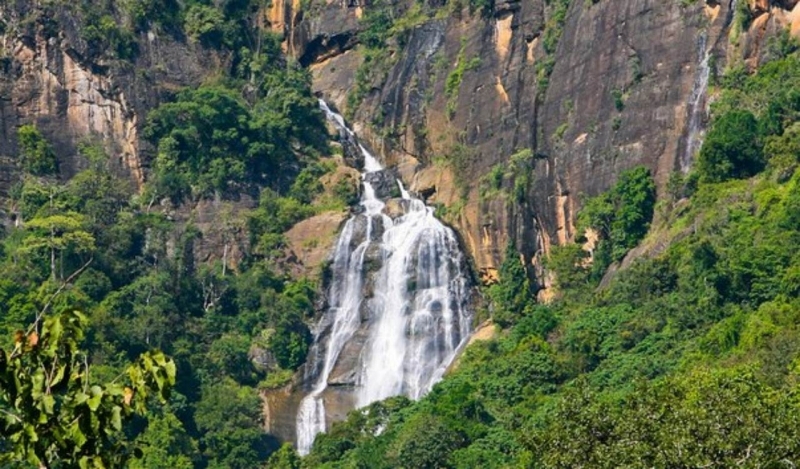 In the misty mountains of tropical Sri Lanka, the wide Ravana falls gushes down a height of 82 feet falling from an oval concave rock. It takes the form of a drooping areca flower during the peak season of its water flow, but its size is reduced dramatically during the dry season. 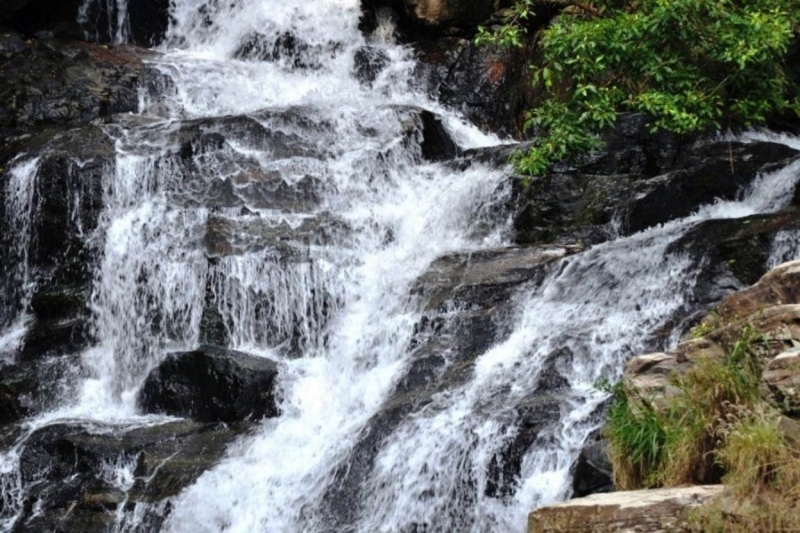 Located in the Ravana Ella Wildlife Sanctuary in Ella, this waterfall is the source of many legends and secrets. Aeons ago there was a king in India who was unable to have any children. Full of desperation he requested his priests to create a homam (sacred fire) to ask the gods for an heir. The gods blessed him and from the fire rose four little globes of light which entered the bellies of his four wives; who found themselves pregnant. They eventually gave birth to four healthy baby boys, the eldest being Rama. Rama was extremely beautiful, brave, talented and kind; for, unknown to his parents, he was the reincarnation of the Hindu God Krishna. Once he attained the right age, he married the equally beautiful and gentle princess Sits and was ordained the heir. However, the happiness was not to last. One of the other wives the king was jealous of Rama’s success and hatched a deceitful plot with the assistance of a witch. The stepmother made the king honor a boon he granted for her assistance at a time of war. Kaikeyi asked that her own son be crowned as king, while Rama was exiled to the forest for 14 years. And so Rama, Sit a and his faithful brother Lakmanan left for the forest with nothing but the clothes they wore. The troubles were only just beginning though. The three made a hut and lived there peacefully for an year until the evil king of Sri Lanka saw them. The king Ravana was from the cruel race Rakshasa who could use magic, and was smitten by the beauty of Sita. He used his magic to kidnap her and took her to Sri Lanka. Sits was imprisoned in a cave; until Rama used his godly powers to create an army and rescued her. So says Ramayanam the Tamil literary epic of love and war. Whilst the story of the Ramayana appears to be fanciful fiction; strangely enough several archeological treasures have been unearthed and locations referred to in the literary epic have been found in actuality. Based on these discoveries, some information has been established as undeniable fact. Ravana was a real Sri Lankan king who lived over 5000 years ago. The technology used by him was advanced with no equivalent in the current world. He was extremely powerful and much feared by his countrymen. He kidnapped a beautiful princess and kept her imprisoned in a cave in Sri Lanka. 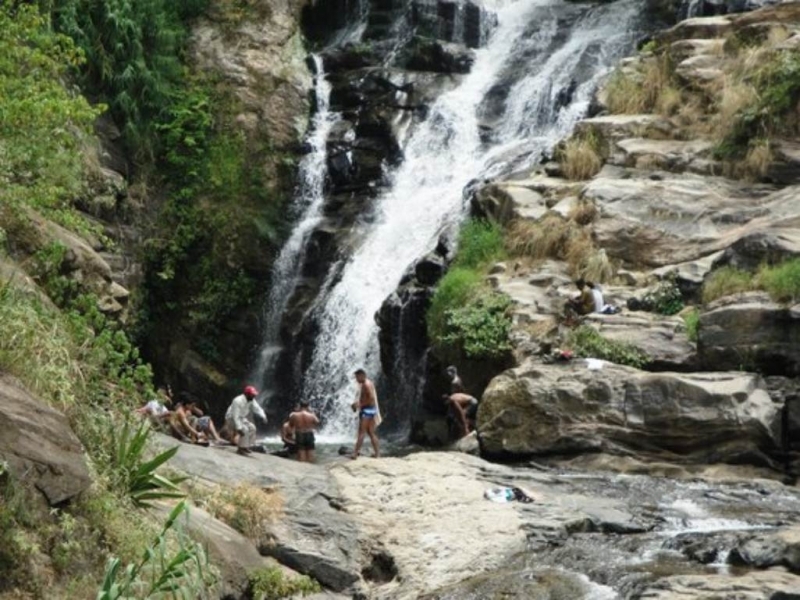 The nearby waterfall was used for her bathing purposes. Ravana created a beautiful garden for her entertainment filled with flowers and fruit trees. The key locations of the cave, garden and launch pad for his flying vehicle have been located in modern Sri Lanka. The Ravana Ella cave is located at the base of a cliff not far from the waterfall. It’s believed to have been the cave where Sita was imprisoned; and is a very popular tourist attraction. Excavations in the cave have revealed evidence of human habitation dating back to over 25,000 years ago.